Today's card features Jillibean Soup's Sew Sweet Sunshine Soup papers and some Summer Red Raspberry Soup wood veneers! 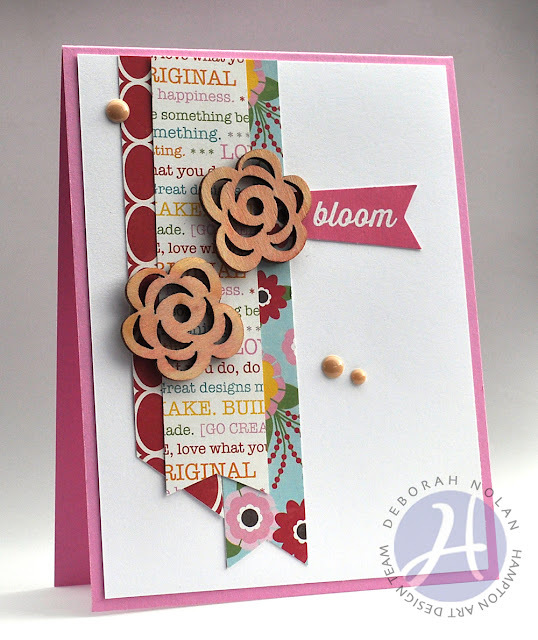 Make card base for a 4.25” x 5.5” card from pink cardstock. Cut and adhere 4” x 5.25” panel of white cardstock. Cut "ribbons" from patterned papers and adhere. (Leave a little room on the far right for the sentiment to slide in. Slide PeaPod sentiment under PP ribbon and adhere. Wash pale pink watercolor over wood veneer flowers; adhere when dry. Oh, so cute. I need to start using wood veneers.